We are a party that views politics as an honest endeavour to bring change to India. We believe the "India Problem" is one of unfulfilled potential and avoidable suffering. It can be addressed. But for that we need parties that are not bankrolled by powerful vested interests. We need representatives who can drive reform that encourages development. We need statesmen who fight for laws and justice, in all fairness. That said, most of us believe the existing system will never let such leaders assume positions of power and responsibility. The flaw in this thought is that the system needs to change before we participate. The reality is that without our participation the system will not change. We need to participate to force the system to change. We must bring in new players who will, in turn, change the rules of the game. We need new players who make people rather than partisan interests the focus of governance. Loksatta Party is a political party with a back-to-basics, pro-citizen ideology that stands for individual rights, economic freedom, and social justice. It is a party that is not trapped in the legacy of the system. It is a party with a comprehensive approach to politics and governance using transparency, decriminalization, electoral reform, a citizen's charter, and legislative and judicial reform. The answer to bad politics is not "no politics". It is good politics. Can Loksatta Party make a difference? In the past few years, Loksatta Party has built flourishing units in Andhra Pradesh, Karnataka, Tamil Nadu, Maharashtra and Delhi. We have eight elected Gram Panchayat representatives and one Sarpanch in Maharashtra and 40 elected Gram Panchayat representatives and four Sarpanches in Andhra Pradesh. We were the party to pioneer the Lokpal Bill in India when our founder, Dr Jayaprakash Narayan, authored and presented it in undivided Andhra Pradesh in 2009. JP was co-author of the Right to Information Bill along with Aruna Roy and others, and was instrumental in getting it passed. The current version of the Lokpal Bill with the government is Loksatta’s revision. As a Member of the Andhra Pradesh State Legislative Assembly from 2009 to 2014 representing Kukatpally constituency, JP demonstrated what can be achieved even while working within the current system. More than Rs650 crore worth of public works were undertaken during his term with zero pilferage, bribes or political corruption. Loksatta Party collaborated with non-governmental organisations to improve the quality of education in more than 70 government schools, all of which now have functioning toilets! The long-pending rail overbridge connecting Hi-Tech City and Kukatpally, which was stuck for years due to an inter-governmental feud between Indian Railways and the Government of Andhra Pradesh saw the light of day after JP's intervention. Perhaps his proudest accomplishment, however, was that more than 5,000 young men and women were provided employment through skills training at our party offices and by bringing employers and jobseekers together. 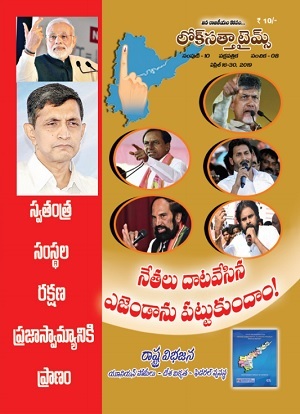 In addition, Loksatta is credited with pushing through electoral reforms and decriminalization of politics via candidate declaration of assets and disclosure of criminal records and with achieving 80GG deductions for political party contributions, creating an incentive for the flow of clean money into politics. The party takes a liberal economic view, championing foreign direct investment in retail, free market policies for the agricultural sector, and, in general, a pro-business climate that leads to the creation of opportunities. The recent passage of the Gram Nyayalaya Bill and Citizen Services Guarantee Bill is a matter of pride for the party, having authored the bills and lobbied, influenced and convinced the government to pass them. Judicial and legislative reforms, along with transparency of governance, are high on our agenda. Combating of corruption and bad governance through an institutional framework that enhances transparency and accountability at all levels of administration.